Here is a list of all the island walkthrough guides we have on our site! You can find each and every island here and if for some reason the one you are looking for is missing, leave a comment to let us know! Early Poptropica – The first Island in Poptropica where people have been getting stuff stolen from them and you have to get it back! Shark Tooth – The citizens of this island are have shark problems and it is up to you to fix it. You may get to save some people while you are at it. Time Tangled – History has been hanged because of a messed up time machine. Use the time machine to go back in time to fix it! 24 Carrot – People are missing and the carrots are starting to disappear on 24 Carrot Island. Find out what is going on and save the day. Super Power – This islands prison had a meteor crash into it which not only let all the criminals out but also gave them super powers. Catch them all and restore order. Spy – 3 spies have discovered something but now they have gone missing. Find out what has happened to them as well as what they have discovered! Nabooti – 7 jewels that protect an ancient tribe have all gone missing. Find them and return them to the tribe for a great reward. Big Nate – Enter the comic strip of “Big Nate” and go on a mission to find a time capsule that has been hidden for years! Astro-Knights – The princess of Astro Knights Island has been kidnapped and taken to the outer limits of space. Find her and bring her back to her people. Counterfeit – Enter a museum displaying some of Poptropica’s most famous art. You will find out that someone is trying to steal it and you need to stop them. Reality TV – Looking to be the star on the next big Reality TV Show? Well now you can. Get on the show and then battle others for the prize. Mythology – Battle evil monsters in the great depths of the sea. You have been recruited by Zeus himself. Do you really want to let the powerful god down? Skullduggery – Battle against sea monsters and even nasty pirates at sea. Control your own ship and crew and be the ultimate ruler of the sea. Steamworks – Steamworks Island brings to to a place where you ill find that no one lives. Uncover what has happened to the people and restore order to how it is supposed to be. Great Pumpkin – All the Peanuts kids form Charlie Brown are celebrating Halloween. Go on an adventure where you will help all of them through this scary night. Cryptids – If you can prove that Cryptids actually exist there is a huge reward waiting for you. What are Cryptids? Any creature talked about but not actually proven to be real. Wild West – The citizens of Wild West Island are being bullied and taken advantage by a nasty outlaw. Its up to you to set this outlaw straight and save the day. Wimpy Wonderland – Manny has gone missing on a snow day that everyone is enjoying. It is up to you and his brother Greg Heffley to find him before the day is over. Red Dragon – Go back in time to ancient Japan where you will run into Samurai Warriors and Sumo Wrestlers. There is a great danger upon you. Shrink Ray – A science fair genius has developed a ray gun that shrinks everything it shoots at. The genius and the shrink ray have both gone missing. Find them! Mystery Train – Its 1893 and every one is aboard a train to the World Fair at Chicago. A crime has happened and might destroy the Fair. Find out what has happened and solve the mystery. Game Show – When you get to Game Show Island you will realize that humans are not controlling the world. Robots are. Save the day and give the Poptropica people control of their island. Ghost Story – Spirits and ghosts are haunting the shores of Hemlock Harbor. Hunt these spirits and set them free so that the people of the island have nothing to fear. SOS – A whale watching expedition and its crew have hit an iceberg in the middle of the sea. It is your job to rescue all the passengers before the ship goes under! Vampire’s Curse – A truce between a Vampire and the mountain village below has been broken by the vampire himself. He has captured a young villager and it is your job to save her. Twisted Thicket – Mysterious beings that dwell in a deep forest have attacked a village on Twisted Thicket island. Enter the forest and find out what is going on. 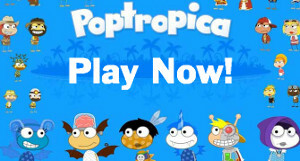 Poptropolis Games – Only once every 100 years does Poptropolis Island rise from the sea. Enter a competition to become the your tribes hero. Wimpy Boardwalk – Its summer as a wimpy kid and Greg and Rowley are making messes at the boardwalk. Clean up their mess and even try to beat Greg’s high score on a video game. Lunar Colony – On Lunar Colony Island you will have to travel to an abandoned space station and find out what has happened to the astronaut. You may also run into some aliens! Super Villain – Enter the most dangerous prison around and infiltrate some villains minds to extract the evil that is in them. Hurry though, you don’t want to be stuck in there forever. Charlie and the Chocolate Factory – You have gotten access to Willy Wonka’s Chocolate Factory but some kids are threatening to destroy his candy creations. Help him stop these mischievous kids. Zomberry – The citizens of Zomberry Island are slowing transforming into zombies and ghouls. Find out what is causing this and then create a cure! Night Watch Island – You get a whole mall to yourself as your own play ground after it has closed. One question though; are you alone? Back Lot Island – Become a star in hollywood and make your own movie! It’s up to you to become a poptropica blockbuster! Virus Hunter Island – Shrink to a microscopic level and go through the human body to fight against a virus! Poptropica Forgotten Islands – The first Poptropica mobile app. Sail the seas and complete quests in this new adventure! Haunted House – This yearly Poptropica island is a must play during Halloween! Poptropolis Games 2013 – The Poptropolis Games are back again for 2018 with two all new events! Mocktropica Island – It’s up to you to save Poptropica and complete this unfinished island! Survival Island – Can you survive in the poptropica wilderness? Be sure to stay warm and find food so you don’t starve! Mission Atlantis Island – It’s time to go underwater in this poptropica island! Hop in your round submarine and get your exploration on! PoptropiCon Island – Check out the largest and interactive sci-fi and fantasy convention the poptropica islands have ever seen!